Here we are, the happy couple , eagerly awaiting a new mission call. We waited six weeks for it to come. Finally the big day arrived and we got an early call from the post office telling us that a special letter was awaiting us. 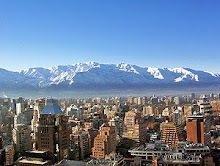 The call was to The Chile Area with a ward assignment to Santiago North Mission. Dave is called as the Area Medical Advisor to the nine missions in Chile and I am his assistant. We were to report to the MTC on April 26 and depart to Chile on May 7. The day we got our call, we left for Salt Lake to attend the theater, the opera and help Micaela move. The next day we got a call on my cell phone telling us that they needed us much sooner as Dr. Dixon, the current AMA is leaving on March 1. 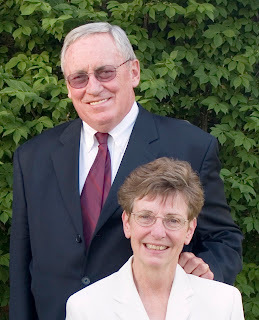 The Area Executive Secretary, Elder Stephen Boyden, Paul's past Mission President, assures us that we can come on tourist visas and he will get our resident visas for us in two weeks, or so, once we are there. We are so very, very excited. We have heard so many wonderful things about Chile and almost everyone we talk to has lived there, has relatives who served missions there or has been on a mission there themselves. We hear that it is safe, developed, friendly and beautiful with a mild climate. We will live in apartments next to the Area offices and across from the temple and the Chile MTC. Apararently there is quite a feeling of 'family' with the missionaries there. They meet every week for FHE and once every two weeks for a dinner on the town. It sounds like we will have plenty of opportunity to speak English but we are continuing to improve our Spanish. We have spent four days at The Church Office Building and the MTC attending meetings of Missionary Medical. They have quite the system of training and preparation which we thoroughly enjoyed. We had classes with two other couples who are also called as AMA's. The Hills, from Blackfoot will serve in Brazil and the Fords will serve in the North America Central Area and will be located in Chicago. We learned about the Church's resources for their AMA's including a web site for doctors and nurses that contains amazing amounts of reference materials on diseases, mental health issues, medications, pandemics, etc. They also have a process for entering information that can be accessed by the numerous volunteer medical consultants of various specialties which will be very helpful for us. One day of training was to increase our abilities with computers including creating our own power point presentation on the common cold, with graphics and sounds. We met with Dr. Hebertson and his sweet wife to learn about responsibilities of the AMA's spouses and other service opportunities for senior missionaries. They were sweet enough to invite us to share some of our experiences with teaching music and starting a children's library. We spent one full day with Dr. Woolley at the MTC. He is a wealth of information on tropical diseases, insects and other vectors, disease prevention, safety, clean water, etc. We also learned of some of the crazy situations that missionaries can get themselves into such as a bat bite while holding a live bat for a photograph. Each day we were up north we spent a night with a different family. That was special for us as we will be leaving those precious grandkids and they will change so much. We even got our own piano recital from two of the grandkids. Their teacher came to their home and they each played about 15 songs for us from books they had just finished. We also finished up our last minute shopping for clothes. On the Presidents Day weekend, all the Utah kids and grandkids came to Fillmore and spent an entire day working in our yard and helping us finish up the pruning, wood splitting and stacking, transplanting, fence fixing, cleaning out of rain gutters and many other things. It amounted to about 50 man hours and what a help that was to us. We enjoyed two great meals together finishing up a lot of the food we still have and then enjoyed a special FHE with sharing of feelings and saying goodbyes. We also got some great news--our youngest daughter and her husband are expecting their third child in October. John and Traci are expecting in March. This last week as been spent deep cleaning the home, finishing up financial issues like taxes, getting computer issues fixed, and starting our packing. Suz cleaned all the carpets in the home and Dave has spent countless hours getting all the bills set up for epay, actually paying bills, etc. We are starting to feel like we are almost ready. For the first few months of our eighteen month mission our home will be occupied by a young couple who are building their own home in Fillmore, Ryan and Angela Hansen. After they move into their new home they will continue to look after the house and the yard. We feel fortunate to have this arrangement with them. We hope that they will feel likewise after it's all over. The plan for this blog is to file a report every few weeks, or so, as occasion dictates. In so doing, we hope to be able to share these experiences with whoever is interested, and we hope that you find them to be of some use.